You are here: Home / General / Prominent ad bidders, buyers unite to create less marketplace confusion. But will it really help? get the same results from both? Which is more beneficial for publishers? What about yield optimization vs. data optimization? firms have banded together to help clear up some of the confusion. A variety of tech platforms have helped make the process of buying and selling display ads more efficient for both publishers and advertisers. But with each layer of technology, another “problem” emerged, which in turn, led to another layer to help solve it. First, ad networks emerged to offer targeting and scale, but that led to bottom-of-the-barrel CPMs for publishers. Then came the yield optimizers like Rubicon, AdMeld and PubMatic; they aimed to help publishers “fight back” by making advertisers bid on publishers’ unsold inventory across networks, and then delivering the best possible CPMs. The yield optimizers created a new suite of tools for time-strapped media buyers to have to adapt to. There were also ad exchanges in the mix, and most of the independents got gobbled up by bigger players like Google and Yahoo. Data exchanges added another layer of audience segmentation (as well as confusion) to the buying process. Firms like MediaMath, DataXu and Turn emerged to help streamline the buying process, pulling in all the inventory and data from a variety of sources, in addition to functioning as an operational dashboard for buyers. The idea of bidding on inventory in “real time” – not in advance, then added another kink in the chain. Much like the notion that the majority of “buy low and sell high” ad networks wouldn’t survive, is the idea there will be a shakeout amidst all these intermediaries. There are definitely specialty platforms for mobile, video, social and targeting that add value, but all of these companies claim to have more effective technology, or strategy, or service – so there’s ambiguity about how much value they’re adding to the process. For publishers, marrying the DSPs to the RTB platforms will mean more potential buyers with access to their inventory; for agencies or marketers that buy online ad impressions, this coalition means more inventory at their fingertips. The end result is more liquidity and, the participants hope, efficiency. Nice sound byte, but a bit idealistic. What’s really going on here is that both advertisers and publishers are questioning the value propositions of all these companies. One by one, the big ad holding companies have acquired or launched their own ad-buying platforms, complete with targeting and RTB capabilities, and dedicated staff. 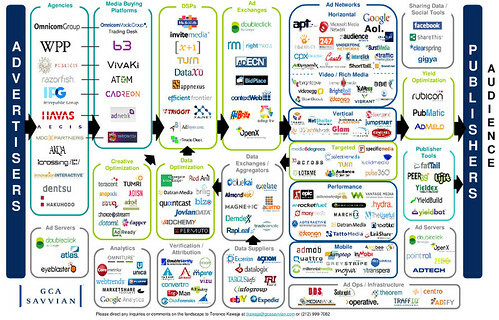 That leaves less room for third-parties like Turn, DataXu and MediaMath. Meanwhile, publishers have too many yield/data/revenue optimization partners to choose from, and many are wondering why they need to give a percentage of their already minimal CPMs to a third party that may not really be adding value. Firms like PubMatic, AdMeld and Rubicon have realized they can all get a bigger share of the pie by working together. Still, these firms in particular have been notoriously competitive, so it will be interesting to see whether they can really collaborate.